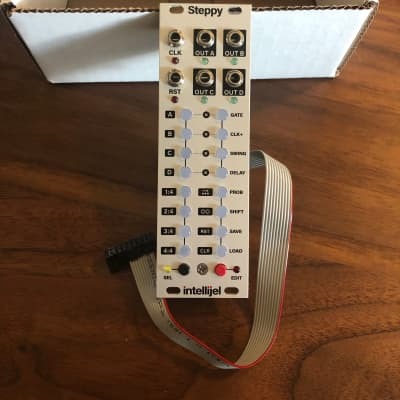 Steppy is a 4-track programmable gate sequencer with eight internal memory slots, external clocking, numerous tweakable parameters, and a performance-first design aesthetic. 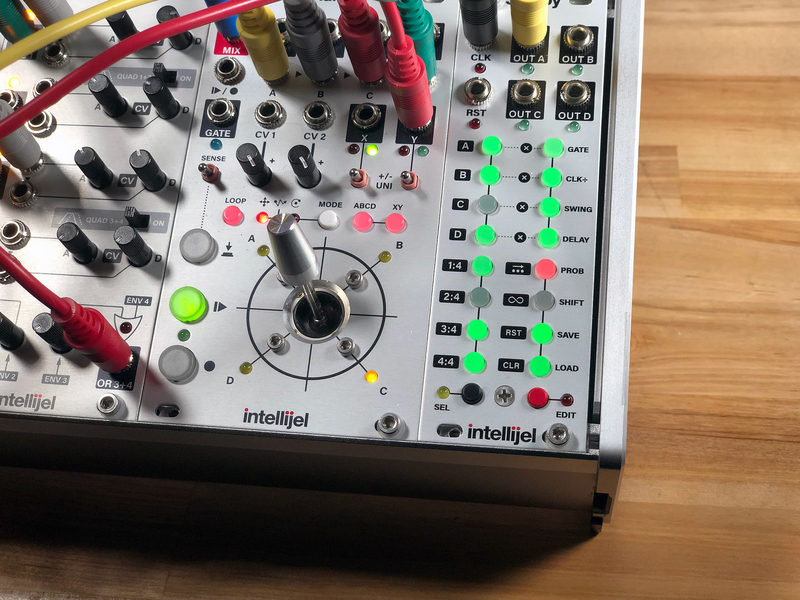 Each track has its own length, which can range from 1-step to 64-steps, allowing for polyrhythms, fills, or constantly evolving gate interactions between tracks. Each track has its own gate length, which ranges from very short to very long, with tied gates possible at the extreme setting. Each track has its own clock divider, allowing patterns to play out over completely different periods of time. Each track has its own swing setting, which offsets the timing of every other step. Each track has its own delay setting, which offsets the timing of every step. Each track has its own probability control, which sets the likelihood that each programmed gate will fire when called upon by the pattern. Each track can be shifted (or ‘rotated’) forward or backward by a number of steps. So if you’ve created a pattern that ‘feels’ like it has its downbeat on step 3, you can shift that pattern two steps to the left, so that the downbeat sits on step 1. Tracks can be selected and modified in real time as the sequence plays. A select button allows you to directly access each track (and each page of 16 steps within that track) directly through Steppy’s intuitive multifunction buttons array. Tracks can be individually muted and unmuted, and a special performance mode (called “Loopy”) enables you to touch any two gate steps and instantly create a performance that loops between those steps. Track patterns can be cleared without clearing its playback parameters, and all track patterns (along with their individual playback and performance parameters) can be saved as a preset to one of eight internal memory slots.